Chennai, Feb 5: Narayanaswamy, the man who underwent intensive physiotherapy sessions in last one year after first double hand transplant in Tamil Nadu, was appointed as ward manager at Government hospital in Dindigul. In February 2018, he underwent the long critical surgery of hand transplant at a government hospital, Stanley Medical college hospital, Chennai. Doctors reconstructed his hands below the elbow. The pair of hands were donated by an accident victim who was declared brain dead. 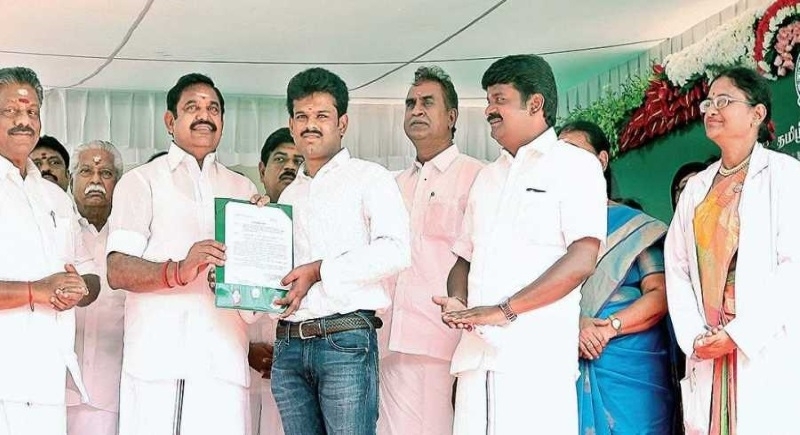 On Monday, after doctors declared him fit to start a new life, he went to meet state secretariat to collect his appointment order from CM Edappadi K Palanswami. Narayanaswamy said, “I burned both my hands when I touched a high-tension wire at a construction site in 2015. I was shattered when both of my hands were amputated. Last year I got a call from transplant surgeons. Now I have two hands”. Rama Devi, Narayanswamy’s surgeon said, “Doctors in Dindigul would help him continue with his theory”. Tamil Nadu is always ahead of many other states in organ transplant. But yet, the doctors and counselors not able to convince families of brain dead patients to donate organs to other’s benefits.